Set just 5 minutes by foot from Palais des Festivals and La Croisette beaches, Hotel Bellevue offers rooms with private bathrooms in the heart of Cannes. Free Wi-Fi access is provided. The air-conditioned guest rooms include satellite TV and have a balcony with views of the surrounding area. Hotel Bellevue Cannes serves a daily continental breakfast which can be enjoyed in the hotel’s private outdoor courtyard. The Bellevue offers an airport shuttle service and provides a car rental or bike rental service. Cannes Train Station is 492 yards from the hotel. Public parking is available nearby for guests exploring the Cote d’Azur region by car. Located in the centre of Cannes, a 15-minute walk from La Croisette and Le Palais des Festivals, MDL Colmar is a secure building that offers self-catering apartments with views of the city. The air-conditioned apartments at MDL Colmar have a flat-screen TV with satellite channels, ironing facilities and a wardrobe. The private bathroom includes jet shower, hairdryer and separate toilet. The fully-equipped kitchenette features a coffee machine, electric kettle, and a microwave. Kitchenware and a refrigerator are also provided. MDL Colmar is 500 metres from Cannes Train Station and 23 km from Nice Airport. Shops and grocers can be found within 50 metres of the property. Hôtel Du Nord is located in central Cannes, a short walk from the train station and Palais des Festivals. It offers free Wi-Fi internet and air-conditioned guest rooms. Each of the Hôtel Du Nord’s guest rooms is soundproofed and has elevator access and a TV. Most have a private bathroom. Guests of the Cannes Hôtel Du Nord can enjoy the hotel's breakfast in the comfort of their room, or in the dining room. Numerous restaurants can be found within easy walking distance. La Croisette Boulevard and Cannes Beach are a 5 minute walk from the hotel and guests visit Île Sainte-Marguerite from the nearby ferry port. Easily accessible from highway A8, this Balladins hotel is located a 15-minute walk from La Bocca Beach. It offers free parking, rooms with private bathrooms and low-cost Wi-Fi. The rooms at the Hôtel Balladins Cannes La Bocca are equipped with TVs. Each bathroom has both a shower and a bathtub. A buffet breakfast is served every morning and the hotel staff is happy to assist you 24 hours a day. The Balladins Cannes La Bocca is located across from the Cannes-Mandelieu Airport. The Boulevard de la Croisette and the Palais des Festivals et des Congrès are a 10-minute drive from the hotel. Apartment Le Marlyne 1 Cannes is set in the Palm Beach district, just 100 metres from the beach. It is made up of 1 large living area, which opens onto a private balcony with partial views of the port. Facilities in this studio apartment include an iron, a sofa bed and a bathroom with a shower. There is also a kitchenette, which is equipped with a microwave, refrigerator and electric hotplates. Local restaurants, grocery shops and a bus stop are just 100 metres away. The Palais des Festivals and Cannes Train Station are a 30-minute walk from the property. Located in the heart of Cannes, just 200 metres from the beach, Hotel Cybelle offers a 24-hour reception, luggage storage and library. Palais des Festivals is 200 metres away. Decorated in a traditional French style, all rooms feature a flat-screen TV and wardrobe, while some also boast a private balcony. The bathroom facilities are private and shared. A breakfast with a croissant, baguette, orange juice, yoghurt, marmalade and hot drinks is served each morning in the guest rooms. Restaurants can be found within walking distance. The SNCF Cannes Train Station is just a 1-minute walk from the hotel and Boulevard de la Croisette is 200 metres away. Free Wi-Fi access is available in the hotel rooms and public parking is possible at a location nearby. Neptune is located in La Bocca, next to the open-air market and 270 yards from the beach. It offers guest rooms with private bathroom, air-conditioning, TV and free Wi-Fi. Set 1.5 miles from central Cannes the Hotel Neptune offers breakfast in the mornings. Guests can find numerous restaurants and bars nearby. Guests of the Hotel Neptune can also enjoy water sports at the nearby beaches and visit the Palais des Festivals and La Croisette in Cannes. A free public parking lot (open and free all year long) located right next to the hotel. Hotel P.L.M. offers low-cost accommodations in the heart of Cannes with free Wi-Fi access. It is a 3-minute walk from La Croisette beaches and Palais des Festivals. The guest rooms include a private bathroom, air conditioning and satellite TV (Canal + cable). Hotel P.L.M. serves a daily continental breakfast which can be taken in the guest room upon request. The hotel is only a few steps from the famous shopping street, Rue d’Antibes. Cannes train station is 380 yards from P.L.M. Hotel. Azur Meublé is in the center of Cannes, just 330 ft from the Croisette and a short walk from the beach. It offers studios equipped with free Wi-Fi access. The studios at the Azur Meublé are equipped with a fan and a flat-screen TV. The kitchens include cooking facilities, a microwave and a fridge. Each studio has a private bathroom. Azur Meublé is just 500 ft from the Palais des Festival, where the Cannes Film Festival takes place, and the SNCF train station is 1000 ft away. Private parking is available in close proximity to the hotel. Set in the historic district of the Suquet, this hotel offers a flower-filled terrace and classic rooms with private bathrooms with free Wi-Fi, just 440 yards from the famous Croisette. Guests are invited to relax on the grounds and enjoy the Plage du Sud beach, just a 10-minute walk from the Chanteclair. A continental breakfast is provided daily and either served in the breakfast room or on the outdoor terrace. This non-smoking hotel offers express check-in and check-out, and free Wi-Fi is also available in public areas. Hotel Chanteclair is ideally located to explore the city by foot. 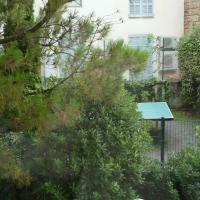 It is within walking distance of Cannes Station and 3 miles from Cannes Airport. Public parking is available 55 yards away, and the first hour is free of charge. Boasting a privileged situation a few minutes from the sea and the famous sea-front promenade La Croisette, Hotel Alan Robert's offers a warm and friendly welcome in a family-run hotel. Free Wi-Fi access is available in the hotel rooms. Hotel Alan Robert's features air-conditioned guest rooms offering a flat-screen TV with over 100 international channels. A fridge is available in the room upon request. All rooms have a private bathroom. In the morning, savour delicious French breakfast in the bright breakfast room. For your comfort, the hotel offers a solarium where you can enjoy a relaxing moment in the sun any time of the year. Public parking is available nearby. These apartments are located a 2-minute walk from Cannes SNCF Train Station and 10 minutes from La Croisette, the Cannes beaches and Palais des Festivals. It offers free Wi-Fi access. Each air conditioned and soundproofed apartment and studio at the Florella Achard has contemporary décor. They feature a fully equipped kitchenette, satellite channels on a flat-screen TV and a private bathroom. Florella Achard central location allows guests to explore Cannes with its chic boutiques or relax on the beaches. There are also a lot of restaurants and cafes nearby. Located in the heart of Cannes, Hotel Atlantis offers a warm and friendly welcome close to the famous Croisette and the harbor. The rooms at Hotel Atlantis all have a unique décor. Some rooms look out onto the local pedestrian streets and others look out onto the hotel's patio. Each room is spacious,decorated with bright colors and equipped with modern private bathrooms. In the morning, get off to a great start with a nice breakfast served in your room or in the Provençal lounge. The hotel is close to public transportation and offers easy access to all parts of the city including the nearby shopping street. Genevriers is located in Cannes, one mile from La Croisette and the beach. It has an outdoor swimming pool, tennis court, and accommodations with free Wi-Fi. Accommodations at the Genevriers are serviced by an elevator and has a private balcony with lawn furniture. Each apartment and studio has a living room and a kitchen equipped with a microwave and dishwasher. Guests of Les Genevriers can enjoy a drink in the bar or on the grounds. On-site recreational activities include ping-pong and mini golf. Les Genevriers has a tourist information center and there is a bus stop 65 ft from the hotel, which provides direct access to the center of Cannes and the Palais des Festivals. A free shuttle is available to take guests to and from the MIPTV, MIPIM, FIF and MIPCOM from 7:30 to midnight. The Hotel Corona is located in the center of Cannes just a 2 minute walk from the Palais des Festivals events center. It offers comfortable rooms and free Wi-Fi. The hotel is in the heart of the shopping district and just 220 yards from the famous Croisette and the beach. Rooms at Hotel Corona are individually decorated, air conditioned and sound proofed. A tasty breakfast is served daily. There are a variety of restaurants, bars and night clubs in the immediate area. A short walk will take you to the historical heritage of the city. The Azurene is located 55 yards from La Croisette and Cannes beach. It offers air-conditioned soundproofed guest rooms. Each has a private bathroom, TV and free Wi-Fi. A continental breakfast is available in the mornings and the Azurene’s staff will be happy to recommend restaurants, bars and stores in the nearby streets. Guests of the Azurene Royal Hotel can find a golf course nearby and snorkeling, diving and fishing can be enjoyed at the nearby beaches. The Azurene Royal Hotel is situated a 5-minute walk from the Palais des Festivals and Cannes Harbour. Nice Airport is a 25-minute drive away and a shuttle bus is available. Located in central Cannes, the Bleu Riva is just 220 yards from the beach at La Croisette and the Palais des Festivals. It offers soundproofed accommodations with free Wi-Fi access. Each room at Hotel Blue Riva is air conditioned and equipped with a fridge and satellite TV. Rooms are also serviced by an elevator and have a private bathroom. A breakfast buffet is served daily at the Blue Riva Hotel, and staff available to offer local tourist information. Guests have easy access to shops, restaurants and the nearby Gambetta Market. The Blue Riva is just a 2-minute walk from Cannes Train Station and the Cannes-Mandelieu Airport is a 4 miles away. Hôtel Select is located in Cannes, 330 ft from Rue d’Antibes. It offers air conditioned guest rooms with satellite TV, Wi-Fi internet and a private bathroom in each. The Select’s front desk is open 24/7 and guests can enjoy a continental breakfast in the mornings, served in the hotel dining room. There are numerous boutique stores, restaurants and bars around the Hôtel Select. Guests can visit the Palais de Festivals, Cannes Beach and La Croisette, just a 10-minute walk away. Résidence Gambetta is located in central Cannes, a 5 minute walk from the beach and La Croisette. It offers studios and apartments with free Wi-Fi internet. Housed in a refurbished townhouse, each of the Gambetta’s apartments and studios has air-conditioning, private bathrooms, soundproofed windows and a kitchen area. Guests of the Résidence Gambetta can visit Gambetta Market, situated across from the hotel. Palais des Festivals is a short walk away and Rue d'Antibes is just 165 yards from the hotel. Located 1 km from Cannes-La Bocca Train Station, Hotel B&B Cannes Ouest la Bocca offers a terrace and simple accommodation. It is a 10-minute walk from the beach and 3 km from the centre of Cannes. All of the rooms at Hotel B&B Cannes Ouest la Bocca have air conditioning and a flat-screen TV. Each room also includes a private bathroom with shower. A buffet breakfast is served daily in the communal lounge. Snacks are available and can be delivered to your room, upon request. Free Wi-Fi is available throughout the hotel. Free private parking is possible on site and Hotel B&B Cannes Ouest la Bocca is 4 km from the Promenade de la Croisette. The Florella République is located in Cannes, just a 10-minute walk from the Boulevard de la Croisette and the beaches. It offers apartments with air conditioning and free Wi-Fi access. The soundproofed apartments at the Florella residence are fully furnished and include satellite TV. Each has an equipped kitchenette with fridge and microwave. The Florella République residence is a 5-minute walk from the SNCF train station and Rue d'Antibes. The Cannes Film Festival site, the Palais des Festivals et des Congrès, is a 10-minute walk away. Hotel Brimer is located in the center of Cannes, a 5 minute walk from the Croisette Beach. It provides air-conditioned and soundproofed rooms near the famous shopping street, Rue d'Antibes. Each Brimer Hotel room has a telephone, flat-screen TV with satellite channels, and a private bathroom with shower. Wi-Fi access is available in the rooms. Hotel Brimer is just half a mile from the Palais des Festivals et des Congrès where the Cannes Film Festival takes place each year. It is a 6 minute walk from the Cannes Train Station. Brimer’s location makes it an ideal base for exploring Cannes. In the Cannes La Bocca district, this Residhotel is a 5-minute drive from central Cannes and Cannes-Mandelieu Airport. It offers studio apartments just 800 ft from the beach. Each studio at the Residhotel Cannes Festival has a kitchenette with hotplates and a mini-oven. Apartments are serviced by an elevator and have a living room with a TV. A breakfast tray is available each morning. The Cannes Festival also provides dry cleaning and a car rental service. A bus service to the center of Cannes stops outside the Cannes Festival Residhotel. It is an ideal base for exploring the French Riviera and parking is available on site. Located in the Carré d'Or district of Cannes, the Azur is just 55 yards from the Boulevard de la Croisette and the beach. It offers soundproofed accommodations with free Wi-Fi. Rooms at the Azur Cannes Le Romanesque are air conditioned and equipped with a flat-screen TV and satellite channels. Some rooms also have a private terrace. Breakfast is served every morning and guests are invited to relax with a drink in Le Romanesque’s bar. The Azur is a 5-minute walk from Cannes train station and the Palais des Festivals. Located in the heart of Cannes, Hotel L’Esterel is just 440 yards from the Palais des Festivals and La Croisette beaches. It has a panoramic roof terrace and free Wi-Fi. The soundproofed guest rooms are equipped with air conditioning, satellite TV and a private bathroom. L’Esterel serves a daily buffet breakfast on its roof terrace, offering views of the Mediterranean Sea and the Massif de l’Esterel. Hotel L’Esterel is only a few steps from Cannes Train Station and the famous Rue d’Antibes with its luxury shops. Nice-Cote d’Azur Airport is 12 miles away. Located in central Cannes, Hotel Lutetia is just 1000 ft from La Croisette and the Palais des Festivals. This family-run hotel offers soundproofed accommodations with air conditioning and free Wi-Fi. Each room has a private bathroom and a flat-screen TV with satellite channels. The Lutetia serves a buffet breakfast daily and the attentive staff can provide local tourist information. The Lutetia Hotel is just 500 ft from Cannes SNCF Train Station and 650 ft from the shopping district of Rue d’Antibes. Free public parking is available 300 ft away. Located in a residential area of Cannes, the Massena Residence is a 20-minute walk from the Palais des Festivals and La Croisette Beach. It offers air-conditioned accommodations with free Wi-Fi. Each studio and apartment at Residence Le Massena has a kitchenette and a living room with a flat-screen TV. Some apartments also have a private balcony or terrace. A continental breakfast is served daily on the Massena’s terrace, which overlooks the floral garden. There is also a game room with a pool table and a lounge area. Private parking is available on site and the Massena Residence is serviced by a local bus to Cannes Train Station and the center of the city. The Albe is located in central Cannes, a short walk from La Croisette and the Palais des Festivals. It offers air-conditioned guest accommodations with Canal+ TV and free Wi-Fi. A continental breakfast is available in the dining room, or served in the comfort of your room. Guests of the Albe can find affordable restaurants on the nearby side streets. Each of the Albe’s guest accommodations also has a private bathroom, elevator access and soundproofing. The Albe-Hotel is just a 5-minute walk from Cannes beach, the ferry port and Marina. Cannes Train Station is within easy walking distance, offering connections throughout France. This design hotel is in the center of Cannes, 55 yards from the Croisette, the beach and Rue D’Antibes. It offers rooms with flat-screen satellite TV and free Wi-Fi. 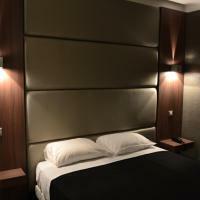 The air-conditioned rooms at the Mistral are all soundproofed. They have private bathrooms with an Italian shower and a hairdryer. Le Mistral is a 5-minute walk from the Maritime de Cannes train station and 55 yards from the Palais des Festivals. Hotel Oxford is located in a quiet residential area, one mile from the Palais des Festivals and La Croisette beaches. It has a beautiful garden with terrace and free private parking. This classic-style hotel offers elegant guest rooms that include air conditioning, a flat-screen TV and free Wi-Fi internet access. Oxford Hotel‘s restaurant, La Terrasse, serves traditional French cuisine and Provencal specialties. Guests can dine by the fireplace in winter or on the terrace overlooking the grounds in summer. Cannes Train Station is a mile from the hotel and Nice-Cote d’Azur Airport is 12 miles away. Hôtel Alizé offers modern style air-conditioned guest rooms 110 yards from La Croisette in central Cannes. Each room also has soundproofed windows, cable TV and free Wi-Fi. Situated 110 yards from the boutique shops on Rue d’Antibes and a 5-minute walk from the beach, the Alizé is well situated for discovering Cannes main attractions. A buffet breakfast is available in the Alizé’s dining room. The hotel staff, available 24/7, will be happy to recommend a nearby restaurant. The Palais des Festivals and Cannes Habour are just 220 yards from the hotel. Guests can leave their bags securely at the hotel during the day of check-out. Located just 220 yards from the beaches of La Croisette, the Anna Livia Hotel is a 10-minute walk from the Palais des Festivals. It offers air-conditioned accommodations with free Wi-Fi. Rooms at Hotel Anna Livia are soundproofed and equipped with a flat-screen TV and international satellite channels. Each room also has tea and coffee making facilities. A continental breakfast buffet is served each morning in the breakfast lounge or in the guest accommodations. The Anna Livia also provides a 24-hour reception and free newspapers. The Anna Livia Hotel is a 2-minute walk from the Rue d’Antibes and the city’s shopping district. The Cannes Train Station is just 765 yards away and guests can easily explore the French Riviera. On large grounds, this Campanile features an outdoor pool with a terrace. The property is one mile from the beach and just a 2-minute drive from Cannes Mandelieu Airport. Every air-conditioned room at the Campanile Cannes Ouest – Mandelieu has free Wi-Fi access. The rooms also feature satellite TV, tea and coffee-making facilities and a private bathroom. The Campanile’s restaurant prepares traditional regional cuisine, which is served in the dining area or on the terrace. A full buffet breakfast is available in the mornings. Guests can enjoy a hot or cold drink in the hotel’s bar. Free private parking is also available. Guests at the Campanile Cannes Ouest can visit central Cannes, La Croisette and Le Palais de Festivals, a 10-minute drive from the property. Florella Jean de Riouffe Apartment is located 50 metres away from Le Palais des Festivals and a 10-minute walk from Cannes Train Station. Each air-conditioned apartment has a fully equipped kitchen and free Wi-Fi access. These apartments have a flat-screen TV with satellite channels. All accommodations have a private bathroom with shower. Guests can prepare their own meals in the kitchenette, which has a microwave and refrigerator. There is also a dining area. Nice is 30 km from Florella Jean de Riouffe Apartment and the beach is 500 metres away. Boutiques with designer brands are a 10-minute walk away on Boulevard de la Croisette. Set in Cannes, ibis Cannes Plage La Bocca is only 100 metres from La Bocca Beach and 3 km from the Palais des Festivals. It has a 24-hour reception and guest rooms include free Wi-Fi access. Each of the modern rooms has air conditioning, a flat-screen TV with satellite channels and a wardrobe. A hairdryer and free toiletries are provided in the private bathrooms. Pancakes, fair trade coffee and fresh pastries are prepared every morning for the buffet breakfast. The bar serves a wide selection of international beers and snacks are available upon request. With private on-site parking available at an extra cost, this hotel is 3 km from La Croisette and the Mandelieu Exhibition Centre is 5 km away. Les Agapanthes is in a park, 1 mile from the center of Cannes La Bocca and its provincial market, at the foot of the Esterel Mountains. It has an outdoor pool, free private parking and apartments with balconies. Each bright and airy apartment has a TV with satellite channels. The kitchenettes include a small dining table and come with cooking facilities, a fridge and a dishwasher. Les Agapanthes de L'Esterel features a stylish lounge area with free Wi-Fi, a bar, a library and a stage for musical entertainment (depending on the season). Guests can enjoy a range of activities on-site, including volleyball, basketball and ping-pong. The Bus Azur stops right outside the residence, which provides direct access to Cannes city center. The Cannes Palais des Festivals is 4 miles from the hotel. Kimi Residence provides apartments just one mile from the Cannes Train Station. It offers free Wi-Fi and free secure parking. The air conditioned apartments have a flat-screen TV with satellite channels. They are fully equipped with a kitchen area with a refrigerator, hot plates and dining and cooking utensils. Some apartments have a balcony. Kimi Residence supplies a grocery start pack upon request. Guests can enjoy a drink in the bar. Kimi Residence is a 5-minute drive from the center of Cannes and La Croisette Beach. Kimi offers a shuttle service to and from the Nice Côte d'Azur and Cannes - Mandelieu Airports. The Palm Beach is located on Cannes’ eastern peninsular, 165 yards from La Croisette and the beach. It offers air-conditioned guest rooms with balcony and free Wi-Fi in each. A buffet breakfast is available in the mornings. Guests of the Palm Beach can enjoy meals and sunbathing on the floral terrace. Each of the Palm Beach’s room also has a private bathroom and TV. Breakfast can be enjoyed in your room. The hotel also offers childcare services and bike rental, useful for discovering Cannes. There are numerous restaurants within close proximity to the Hotel Palm Beach. The Palm Beach Casino is a short walk away and guests can visit central Cannes and the Palais de Festivals, one mile from the Hotel Palm Beach. This bed and breakfast is located in Cannes city centre, a 10-minute walk from the Boulevard de la Croisette. It offers a shared lounge with an LCD TV and free Wi-Fi internet access. Each room is decorated in a contemporary style and has access to a shared bathroom. You can also relax on the terrace or play the piano in the lounge. A microwave, oven and coffee machine are available in the communal kitchen. You can also eat at one of the several restaurants in the surrounding area. Cannes Train Station is a 10-minute walk away and the beach is 2 km away. Nice Côte d'Azur Airport is a 20-minute drive from T5 St-Jean. Florella Clemenceau is located in central Cannes, a short walk from the Marina and Palais des Festivals. It offers air-conditioned apartments, each with a kitchen and free Wi-Fi. All of the Clemenceau’s apartments also have soundproofed windows and each has a private bathroom and a lounge with LCD satellite TV. Guests of the Florella Clemenceau can find numerous restaurants within easy walking distance of the hotel. La Croisette is situated just 853 yards from the hotel. Centrally located just a 5-minute walk from Cannes SNCF Station, Florella Marceau offers fully equipped apartments on a quiet street. All the apartments are decorated in a contemporary style. They rooms are air conditioned and come with a kitchenette and a flat-screen TV. Guests have access to free Wi-Fi. Florella Marceau is just 10 minutes from La Croisette, the Cannes beaches and the Palais des Festivals. The main shopping area of Rue d’Antibes is within walking distance. La Villa Tosca is located 330 yards from Cannes’s train station and a 5-minute walk from the Croisette Beach. It offers air-conditioned accommodations with free Wi-Fi and a 24-hour reception desk. Rooms at Villa Tosca have a floral décor, satellite TV and private bathrooms. Some rooms also have a private balcony. Guests of La Villa are can relax in the main lounge, which features Beaux Arts furnishings. It is just a 5-minute walk from the Palais des Festivals et des Congrès. Set within an 18th-century-style mansion, Ruc Hotel is located in the center of Cannes, less than half a mile from La Croisette and beaches. It has private grounds and offers free Wi-Fi. Each of the guest rooms has a contemporary decor with antique furnishings and includes air conditioning and satellite TV. Guests can enjoy a daily continental breakfast on the hotel’s grounds, or on the roof terrace with panoramic views of the city. In addition to a reading room and solarium, Hotel Ruc also provides a 24-hour front desk and an ironing service. The Ruc Hotel is 1700 ft from the Rue d’Antibes shopping street and a 15-minute walk from the Palais Des Festivals. This Residhotel is located on the Cote d’Azure, 1 mile from central Cannes. It has an outdoor pool, a patio, sunbathing terrace and each room has a balcony with outdoor furniture. The Villa Maupassant offers guest rooms with private bathrooms, each with satellite TV and a kitchen. Each kitchen has an oven, fridge and a coffee maker. Residhotel Villa Maupassant is situated next to the Gare de Cannes La Bocca and 2 miles from the Palais des Festivals and Cannes Harbor. 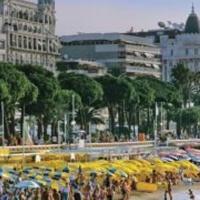 This Residhotel is a 5-miunte walk from the Palais des Festivals and La Croisette beach. It has a private terrace and offers soundproofed apartments with a private balcony and air conditioning. Apartments at the Residhotel Les Coralynes have a living room with a TV and private bathrooms. Each apartment has a kitchenette equipped with an oven, hot plates and a fridge. The Coralynes Hotel provides an underground parking garage and all apartments are serviced by an elevator. Cannes SNCF Train Station is just 550 yards away and guests can easily explore the French Riviera. ibis budget Cannes Centre Ville is in the heart of Cannes, a quarter mile from the train station. It has soundproof rooms and free Wi-Fi. 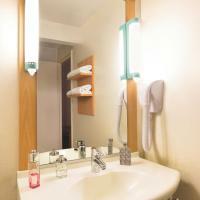 The rooms at ibis budget Cannes Centre Ville have flat-screen satellite TV and a private bathroom. The rooms are accessible with an elevator. A buffet breakfast is served each day, and restaurants are within 165 ft of the hotel. Additional facilities include a 24-hour front desk desk, beverage and snack vending machines. The hotel is just under half a mile from the beach and the Palais des Festivals et des Congrès. Marineland Animal Park is 12 miles from the property. Public parking is available on site for an additional fee. Résidence Le Miradou is located 400 metres from Cannes Train Station and Rue d'Antibes shopping street and offers a fitness centre, a solarium and a rooftop terrace with panoramic views of the Mediterranean Sea. The apartments and studios at Le Miradou are spacious and offer an LCD TV. Each is air-conditioned and also has a kitchenette with a microwave for preparing meals. Breakfast is served every morning in the restaurant or on the terrace. Guests can also enjoy an aperitif from the bar before sampling the residence’s Mediterranean cuisine. The residence is 500 metres from La Croisette and the Palais des Festivals; and the old port is a 10-minute walk away. Nice Cote d’Azur Airport is a 25 km drive away and private parking is available on site for guests with a car. Hotel Athénée provides 3-star accommodations in the center of Cannes. It is a 5-minute walk from the Croisette Beach and Palais des Festivals. Free Wi-Fi is available throughout the hotel. Athénée's rooms are soundproofed and air conditioned. Each room is equipped with a minibar, satellite TV and a private bathroom with bathtub or shower. Some rooms have a private terrace. There are a variety of restaurants and bars within walking distance of the Athénée. Hotel Athénée is located less than half a mile from the Cannes Train Station. Little Palace is a 5-minute walk from the Palais des Festivals and the Croisette Beach. It offers air-conditioned rooms with a flat-screen satellite TV and a 24-hour front desk. The soundproofed rooms at Little Palace are equipped with a telephone and private bathroom with shower. Each room is accessible by elevator. Little Palace Hotel is just 110 yards from Rue d'Antibes, Cannes’s main shopping street, and 330 yards from Cannes Train Station. Guests have access to a public parking lot 55 yards from the hotel. The Congrès Et Festivals is located 55 yards from Rue d’Antibes in Central Cannes. It offers free Wi-Fi and air-conditioned guest rooms with a flat-screen TV and minibar in each. The Hôtel Des Congrès Et Festivals serves a continental breakfast in the mornings, which can be enjoyed on the hotel’s balcony. All of the hotel’s rooms also have soundproofed windows and elevator access. Guests can find numerous bars and restaurants in the surrounding streets. The Congrès Et Festivals is situated a 10-minute walk from Cannes Beach, the Palais des Festivals et des Congrès and Cannes Harbour.